Most of us can rest easy – but if you’re feeing your dog raw food in Washington state, you may want to pay attention. 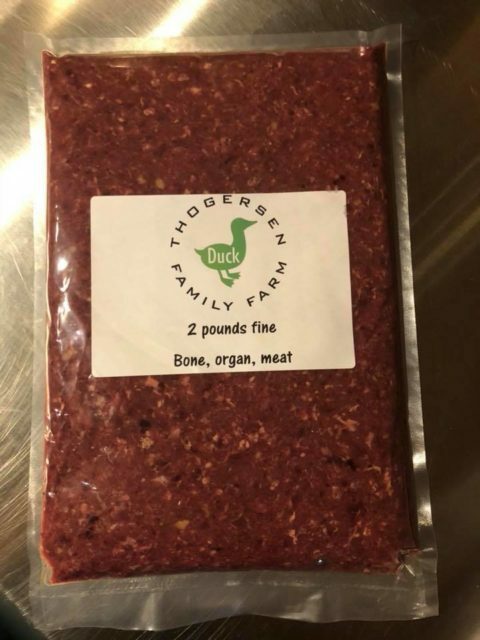 Thogersen Family Farms, a small company in Stanwood, Washington, creates raw food that is only sold in a few retail stores, but they also deliver directly to customers. Thogersen Family Farms announced a voluntary recall of some of their 2 pound packaged products after samples tested by the Washington State Department of Agriculture were found to contain the bacteria Listeria monocytogenes. Thogersen Family Farms does not use batch or lot numbers for their products, but have recalled the following, which were sold in clear, flat rectangular plastic with a white label. An FDA study of 1,000 samples found that raw food is much more likely to contain listeria than processed dog foods. There have been multiple recalls for raw foods in recent years due to listeria. Both humans and dogs can be affected – so be certain to wash your hands well every time you handle your dog’s food. Symptoms of listeria will vary from dog to dog. Some dogs may appear to be sick, others won’t show any symptoms but still carry the bacteria. Symptoms you might observe include diarrhea, fever, lethargy, vomiting, and a lack of coordination, among other things. If left untreated, listeria can cause death – which is far more likely in dogs than humans. Dogs with weakened immune systems, puppies and senior dogs are more susceptible to experiencing a severe infection than others. If you believe your dog has been infected with listeria, take them to see a veterinarian immediately. Discontinue use of any recalled products you may have in your home and discuss alternatives with your vet. For more information on this recall, see DogFoodAdvisor.com.